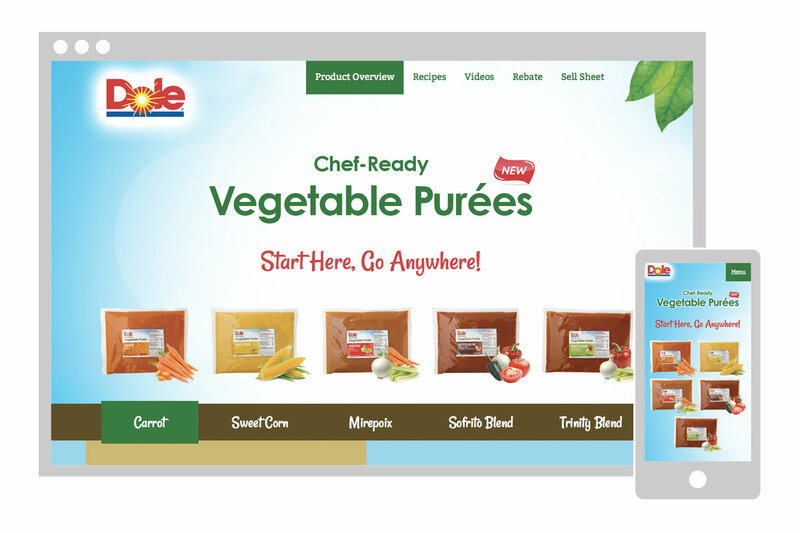 To help introduce Dole’s new line of Chef-Ready Vegetable Purées to foodservice operators, I designed a standalone microsite that would help to introduce the new product and feature recipes that utilize the new purées. The site is fully responsive, and offers a more playful look at the new products than the more information-focused nature of the Dolefoodservice.com site. I used warm green, orange and brown colors and script type for the headers to create a natural, earthy feel. Product and recipe shots on a wooden table-top, juxtaposed against a vegetable field bring to mind the simple ingredients found in these products.